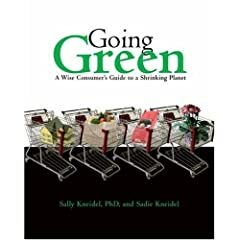 I've mentioned in earlier posts that Sara Kate and I are working on a book about green consumer choices. Like Veggie Revolution, this book will be full of short interviews and "student voice" sections. These will be brief quotes from anybody and everybody of all ages about the subjects in the book. Right now, we're looking for comments on topics related to green choices in transportation and housing. "I don't have a car because I don't have my license. It's just never been convenient to get it. Ideally, I'd like to live somewhere with good public transportation, and never need a car. I guess I should get my license, so I could help drive on road trips, or drive friends' cars occasionally, but I don't really want a car of my own. Even if I could afford it, I don't want the responsibility. Or the guilt! "Not having a car isn't too difficult. In Washington DC, it was really easy; I took the bus and metro everywhere. And in my hometown, which is a very small town, I rode my bike everywhere. It was actually good for me; I rode my bike a lot more in high school than I would have if I'd had a car. What's tough is living in a mid-sized city like Greensboro. It's not too hard to catch a ride to school with a friend, but Greensboro's public transportation system is pretty mediocre. Actually, it's awful. If I want to do anything on my own, like go to a concert nobody else wants to go to, I'm out of luck." "I just bought a used Honda. Originally I'd hoped to get a diesel vehicle, and either make my own biodiesel or convert it to run on greasel. But I couldn't find a reliable diesel car anywhere! They all had something weird about them, and I needed a car right away, so I could get to work. Maybe I can still do biodiesel later in life, but for now it just wasn't practical. I wouldn't want to pay to get a crappy car converted and then have to get it replaced anyway. 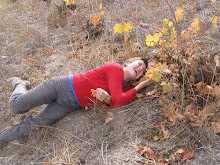 "It was pretty easy for me to learn about the options, at least. I know all about how to make biodiesel now, and if I wanted to have a biodiesel or greasel car, I'm sure I could do it. Obviously it would be a lot easier if we had more resources, if there were more people doing it... but what's going to make these alternative options take precedence over gasoline is those people who get out there first and do it on their own. For those first people it's hard, and there's not much support or information or resources, but it sets a precedent. It gets people talking. It shows that people are paying attention, and that we care about this stuff. We are so dependent on gasoline and finite resources... the end seems like a long way off, but it's not. So yeah, it takes some research, but look how much I know now! "I also want to get a bike, for going short distances. Although this just isn't a biker's world, unfortunately. It's dangerous! I thought about riding Emily's bike to work when I worked just down the street, but Battleground Avneue? It's a three-lane channel of death. I'd be taking my life in my hands daily. Even with protective gear on, I wouldn't feel safe." If anybody would like to send us a paragraph or two or three on any of the following topics, we would love to have them. The working title of the book is The Power of Your Pocketbook: How Americans' Consumer Choices Shape the Future of the Planet. The deadline is June, the book will be out from Fulcrum in spring of 07. If you would like to contribute, we can use your first name, first and last name, or it can be anonymous. It's up to you. Have you ever had to rely on mass transportation for your daily stuff - shopping, getting to work, and so on? any comments on that, good or bad? Have you ever lived anywhere where you didn't have a car and had to walk or bike everywhere? was that a problem? Have you lived or traveled in another country that is less reliant on cars? What is/was that like? Is either local or organic food a priority for you? Which is more important to you and why? Have you lived or traveled anywhere where you saw specific results of globalization, or saw impoverished women working for pennies a day in sweatshops, or other examples of American corporations exploiting workers in developing nations? any anecdote or image appreciated, or a tirade. Either one. Or if you would like to comment on something I didn't specifically ask, but is related, feel free. The gist of what we're getting at, in the sections on transportation and housing, is how Americans use more than our share of resources and energy by relying heavily on gas-guzzling cars, and and by heating and cooling our buildings inefficiently. Among other things. If you want to write something, you can send it to me directly at treeduck@earthlink.net. I'll need a way to contact you in case we have a question. I got this notice via email yesterday, from Mark Retzlaff of the Portland Peace and Justice Center. Sounds like an interesting bike program. His email is mark@portlandpeace.org. communities. Live with the land and camp under the stars. Change your world, one mile at a time. WE ARE GIVING ONE OF OUR TOURS AWAY -- VISIT OUR WEBSITE TO WIN! method of transportation available: your own bike. building, appropriate technology and sustainable energy. restoration and indigenous building practices. about natural history, deep ecology, and environmental ethics. in places through which you travel. longing for a better world. Thursday night Sara Kate and I met some folks from the Very Vegetarian Society of Winston Salem, at our Earth Fare presentation in Greensboro (NC). They have a well-done and useful newsletter, with recipes and articles on nutrition, and a webpage at www.veryvegetarian.ws. They told us about the North American Vegetarian Society, www.navs-online.org, and the annual Summerfest organized by NAVS. They go every year and love it. Sounds interesting. We interviewed a couple of people from Chapel Hill the next day, for the new book. We're working on the section now on eco-friendly cars. Talked to a woman named Kim who bought a conversion kit for her diesel Subaru so that her car can now burn vegetable oil as fuel, instead of the petroleum diesel most Subarus use. Now that she has the conversion kit on her engine, Kim could buy vegetable oil from the grocery as a fuel for her car, but that would be very expensive. So she, and a growing number of other grass-roots environmentalists, are filling their tanks with used vegetable oil that is discarded by restaurants. It's called greasel or "straight veg" by those who use it. The cool thing about greasel is that it's free and guilt-free. It's a subversive, non-taxable, non-polluting fuel that's not dependent on our Middle East affairs to keep the supply flowing. Greasel is a true do-it-yourself fuel that frustrates the government and industry folks who want to get in on the action in some way. I like the recycling aspect; Kim is re-using oil that will otherwise be thrown away. She picks up her used oil from a restaurant in Carrboro - they save it for her. It's a Mexican restaurant, so her car smells like tacos and burritos when she drives. If she got her oil from a doughnut place, then her car would smell like doughnuts. Could be worse! Greasel, also called "straight veg," is not the same thing as biodiesel. 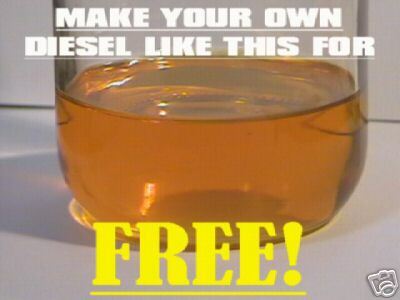 Biodiesel is a vegetable oil that has been chemically altered, so that a conversion kit is not necessary for your car. You save money on the conversion kit, which can be pricey, but the downside is that biodiesel is not as easy to find as straight vegetable oil. I've been told that there are only about six biodiesel stations in North Carolina. Not sure if that's true. Plus, biodiesel is expensive - more than $3 per gallon. In some places, owners of diesel cars are pooling their resources and forming coops to make their own biodiesel, or bring it in from somewhere else. But before you get too excited - remember that to use either greasel or biodiesel, the car must have a diesel engine. Since only 3% of new American cars are diesel, that cuts out most of us. We're also learning about ethanol as a biofuel for gasoline engines. Cars can be modified to use a fuel that's 85% ethanol, which cuts way down on harmful tailpipe emissions and greenhouse gases. But more on that later. I've been reading more today about green cars. Eco-friendly cars, that is. Getting ready to interview a couple of people about biofuels and alternative car technologies for the book we're working on now, The Power of Your Pocketbook: How Americans' Spending Habits Shape our Future. It's interesting that Bush gave lip service in his state of the union address on Jan 31 to our energy dilemma. He seems to want to decrease our dependence on foreign oil, and to increase spending somewhat on renewable and sustainable sources of energy for cars. Yet the amount he proposes to spend is a drop in the bucket compared to what's needed. If the federal government can't commit to research, development and especially putting new development into practice, then industry won't commit either. Bush says he supports the use of waste plant matter, such as switchgrass and wood chips, to make ethanol for gasoline engines. That would be great if he really meant it. But the Department of Energy is only funding a pilot project, and has no plans to convert switchgrass or any other plant waste into ethanol on a commercial scale. Daniel Kammen, director of the Institute of the Environment, says that a car can be converted to use ethanol with only $100. He says the demand is there, if the supply of ethanol was ready. But it's not. Greasel is popular here in North Carolina, at least in the Triangle area, as an alternative biofuel for cars. But greasel can only be used in a vehicle that has a diesel engine. Biodiesel is another fuel option for diesel engines. Greasel is straight vegetable oil; biodiesel is vegetable oil that has been modified chemically. The nice thing about greasel is that it can be free. Using it requires first of all buying a conversion kit for your diesel engine. But after that, many greasel users get their vegetable oil from fast food restaurants that are throwing it away. Biodiesel, on the other hand, does not require the conversion kit but can be costly and hard to find. At any rate, as I mentioned, both greasel and biodiesel are usable only in diesel engines. And very few American cars have diesel engines. So....back to ethanol, for a widespread biofuel solution. For now. As Daniel Becker of the Sierra Club points out, the most effective thing Bush could do right now is to mandate that all new cars get better gas mileage. He could do that right now. Certainly we have the technology to make all cars get 35 or 40 miles per gallon. So, if Bush really means what he's saying, then why doesn't he do that? Why? I don't know the answer to that. I suppose he's protecting automakers' financial interests. Everything boils down to supporting big business for Mr. Bush. But I don't see the connection exactly. If someone would like to explain it to me, I'd like to hear it. Who is it that would suffer and complain if new legislation made all cars get better gas mileage? I just talked to a woman who works for Georgia Organics, an organization in Georgia that supports organic farmers and farmers who use sustainable practices but may not be certified organic. Sara Kate and I will be at Earth Fare in Athens Georgia (home of University of Georgia) on February 6 from 4:00 to 7:00 and at UGA's Great American Meatout on March 20, sponsored by Speak Out for Species (see www.uga.edu/sos for details later about our presentation). But anyway, the person at Georgia Organics told me that Georgia doesn't have nearly as many hogs as North Carolina, but has more chickens than any state in the US - 1.75 billion broilers every year. Whoa, is that right? That's what she said. She said corporate chicken farms are particularly numerous around Athens, and that their waste drains into the North Fork and the Middle Fork of the Oconee River, which I've rafted with my family. Beautiful wilderness areas. She said in Georgia there is a law that keeps chicken farmers who raise fewer than 20,000 birds per year from marketing their birds to the public. 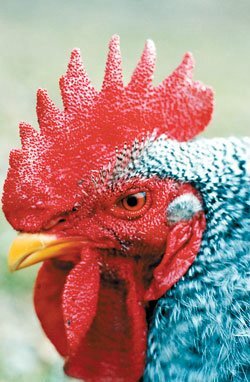 So that knocks out small farmers who might raise a few chickens at pasture, unless they want to take a risk and sell the birds on the sly to their neighbors. All the chicken in Georgia has to be produced by factory farms owned by corporations like Tyson, Goldkist, Perdue, etc. That's bad. I'm a vegetarian, but I do believe that for folks who eat meat, it's so much better for the animals and for the environment to buy pasture-raised animal products. Rather than products from animals raised in misery, crammed into stinking crowded dark warehouse-like buildings. 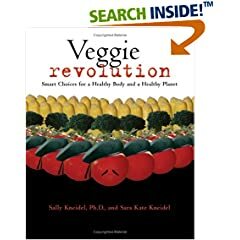 We describe our visits to such miserable places in Veggie Revolution. In the Athens area, Farm 255 is a restaurant that uses locally grown produce. Full Moon Farm is one farm that provides produce to that restaurant; they also offer CSAs to consumers. A CSA is a yearly agreement, where the consumer pays the farm a yearly amount, and the farm delivers a box of produce to that consumer every week. CSA stands for Community Supported Agriculture. Athens also has a coop for consumers who want local and/or organic produce: http://locallygrowncoop.com. The contact person fo the coop is Eric at 706 245 9774. Another person in Athens told me that Athens has a coop called Daily Groceries Coop. Georgia Organics is offering a sustainable ag conference on Feb 10 and 11. They're working on a brochure to go out this spring that will be a statewide guide to sustainable producers who market their food to their local communities. Visit their website www.georgiaorganics.org to find out how to get the brochure or to learn more about the conference. I just found out today about the Appalachian Sustainable Agriculture Project. Need to do some research about that. If you have more tips about the movement for a healthy, humane, and environmentally sound food system in the Georgia area, please post comments or email us. We want to be ready for our Georgia visits in March and April. We'd love to come to your community too and talk about factory farming, and the alternative food movement. It's gaining steam! Email us at treeduck@earthlink.net. Now, What's in that Pet Food? Sara Kate and I have been doing research for our new book about the power we have as informed consumers. When we buy selectively, we are making a conscious choice about which corporations to fund and which corporations will shape the future of the planet. Sara Kate and I are trying to make more deliberate choices ourselves, as consumers. We're trying to find out what all these corporations are up to. Does anybody have any leads or links to info about pet food or pet treats? About Greenies? I met somebody the other day who used to work for Purina. He told me that Purina no longer exists, it was broken up and went to Nestle, which now does all the pet chow, and Cargill, which now does all the industrial chow. Both companies kept the Purina label though because it's so familiar and popular. Both the pet chow and the industrial chow for farmed animals are composed largely of slaughterhouse waste ("meat by-products"). Does everybody know that? I've sort of lost my perspective, after hearing a variety of people expound on the topic. By-products include heads, organs, feet, fat, skin, chicken poop, "feather meal," bone meal, etc. My friend said that, in the hog-chow industry, they say of pigs that "the only thing wasted is the squeal." Are there pet foods, pet treats out there that don't include that glop? Although - really, is the glop all that bad? I understand that it is illegal now to use the carcasses of animals that dropped dead on their own, without being killed. In case they were sick.